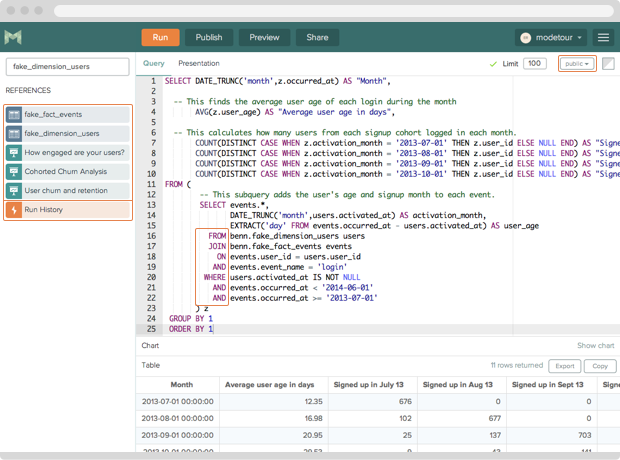 Mode, a startup that launched last year under the tagline of “GitHub for data analysis,” has raised $2 million in venture capital and is opening a beta version of its service to the public. Formation8 led the round, with participation from Panorama Point, Goldcrest and a number of individual investors, including Reddit founder Alexis Ohanian. Derek Steer, Mode’s co-founder and CEO (pictured above, second from right), explains the company’s platform as being similar to GitHub in theory but significantly different in practice. It’s a place where data analysts can share their work and find others’ work (datasets, models, code, etc. ), establish reputations for themselves, and generally reduce the need to reproduce analyses or clean messy datasets that others have already done. Users can clone others’ work and start their own analysis from that point rather than starting from scratch. Where Mode differs quite a bit is that it lets users actually work on data right from the browser. 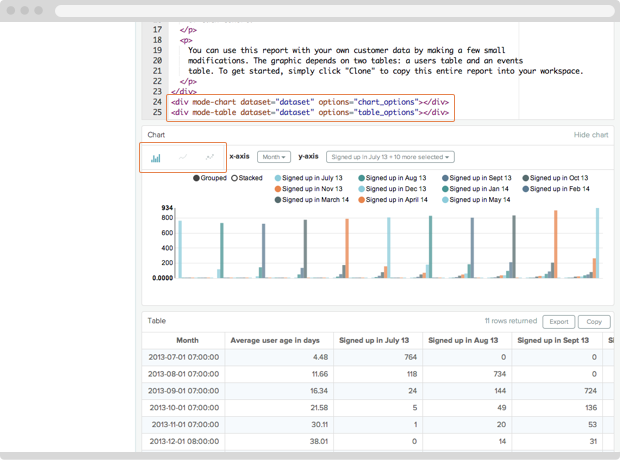 It connects to several popular databases and data warehouses; users can work on data with a SQL editor and a visualization editor; and the charts users’ create are embeddable. There’s a paid version for private organizations that’s walled off from the public version. Overall, Steer said, Mode is “very Yammer-like in its construction” — not such a surprising statement considering he and his two co-founders all came from Yammer. Despite all the excitement around data science over the past couple years, though, it’s fair to ask how big a business there is in building companies that cater to data scientists or similar roles. It’s a very specific audience that already has preferred sets of tools and probably their own data, and analytics startups seem to be on a mission to minimize the need for data specialists altogether by creating visual interfaces for everything. Already, he noted, there are people doing some cutting-edge things in Mode, including prepping it as the home base for “canonical” datasets and analyses. I have just made some SQL queries on Mode.